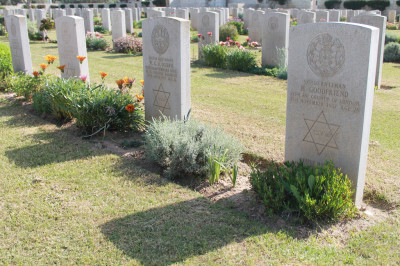 On a recent, sunny afternoon, Kath Henwood, a Yorkshire paramedic volunteering in the Gaza Strip, walked through rows of headstones at the Gaza War Cemetery with a camera and notebook. 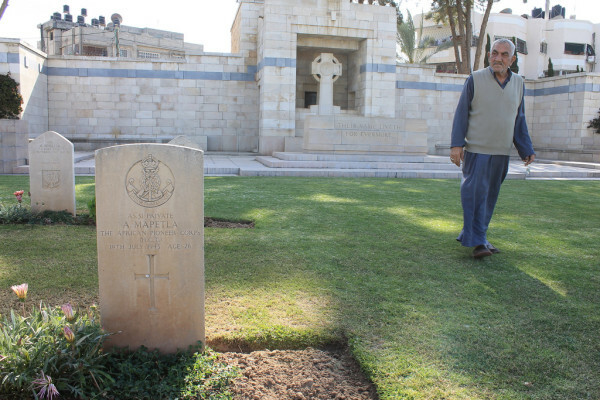 The cemetery, off Saladin street in northern Gaza City, is one of thousands maintained by the Commonwealth War Graves Commission (CWGC), a consortium of Australia, Canada, India, New Zealand, South Africa and the United Kingdom. It contains 3,691 graves, all but 474 of them for First World War troops from the Commonwealth of Nations. A further 210 are from the Second World War. Others include Egyptian and Turkish soldiers, as well as Canadian United Nations peacekeepers. Their memorials, from simple headstones to an imposing “cross of sacrifice” — a memorial found in numerous CWGC cemeteries — reflect their varied faiths: Christian, Jewish, Hindu, Muslim and secular. And the careful landscaping and quiet solitude around them make the cemetery an attractive destination for everyone from picnicking families to students looking for a place to study. 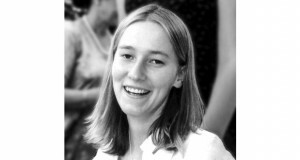 After she told him about it, Henwood’s colleague sent her a list of 19 graves, and asked that she photograph them. Ibrahim Jeradeh, the cemetery’s longtime caretaker, helped her find them quickly. Later, sitting on a marble bench in the shade of the cross of remembrance, he spoke about the cemetery and his life taking care of it. “War is war, and killing is killing,” he said, passing a hot cup of sugary tea. It was a theme to which he would return again and again. Now 77, Jeradeh started working at the cemetery, then overseen by his father, when he was 20. He officially retired as its head gardener at 65, when his son Issam replaced him. But politics have rarely left Jeradeh or his trees alone for long. In 2006, Israeli troops bulldozed the cemetery’s perimeter wall and six of its headstones. Months later, an Israeli military helicopter fired its cannon at one of the large memorial stones. “Two dozen other headstones have been pockmarked by shrapnel from Israeli artillery and several have been completely destroyed,” The Daily Telegraph newspaper reported (“Fury as Israelis damage war cemetery,” 13 November 2006). During Operation Cast Lead, Israel’s military offensive against the Gaza Strip in late 2008 and early 2009, Israeli forces bombarded the cemetery, striking it with at least five shells and singing its grass with white phosphorous (“Israel shelled UK war graves in Gaza,” The Daily Telegraph, 20 January 2009). The bombing again damaged the perimeter wall, along with 363 headstones (“The mighty march of progress: British war graves in Gaza,” Ma’an News Agency, 9 November 2010). “There were no fighters here,” Jeradeh said. After each of these attacks, the British government lodged rare demands that Israel compensate it for the costs of repairing the cemetery. Israel ultimately complied, paying £20,600 ($34,400) in 2008 and £40,000 ($67,000) —less than half the £84,000 ($140,000) requested — in 2011. The Israeli siege of the Gaza Strip has also affected the cemetery. In February 2009, a year after Paul Price’s appointment as CWGC’s regional supervisor for Israel and the occupied Palestinian territory, he had yet to be allowed by Israel to enter Gaza (“Battle still rages where my great-uncle fell in Gaza back in 1917,” The Observer, 22 February 2009). In May 2013, a year after a seemingly simple pump failure had left the cemetery’s grass and flowers parched, the CWGC said that finally replacing the pump “proved challenging” (“Gaza war cemetery returns to former green glory,” Commonwealth War Graves Commission, 30 May 2013). Despite its foreign affiliations — which ultimately afforded it some protection — the cemetery has also been targeted by Israel culturally, as well as militarily. Following Israel’s 1967 seizure of the Gaza Strip, Moshe Dayan, then Israeli defense minister, sought to exhume the cemetery’s five Jewish graves and take them to Israel. The attempt came as Israeli forces looted thousands of historical artifacts, particularly Jewish ones, from their newly-occupied territories, an effort in which Dayan participated enthusiastically as both a military official and a private collector (“Stealing Palestine’s history,” This Week in Palestine, 1 October 2005). 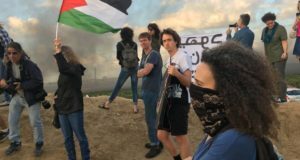 Surrounded by fields of grass and rows of colorful flowers and polished stones, the troubles of occupation and siege seemed as distant as Jeradeh’s clash with Dayan. Maintaining the cemetery’s immaculate condition is hard work, Jeradeh said, even in retirement. Officially, since his mandatory retirement, Jeradeh has served as the cemetery’s night watchman. “I keep this place completely safe,” he said. In practice, his work as a gardener has continued, if not at the same rate. He also spends time with visiting family, including four sons and nine daughters. When asked how many grandchildren he had, he laughed. When asked how long he has kept his journals, he laughed again. “I don’t remember. I have books like this,” he said, gesturing at the height of his shoulder. He showed his study, a detached building, behind the larger gardener’s quarters at the cemetery’s edge, equipped with a personal computer and filled with stacks of books and printed articles. “Everybody knows that war is war, and killing is killing,” he repeated, gesturing again at the thousands of stones surrounded by his carefully-tended flowers.